What is the seamless free product reward? Also known as: buy with points, Seamless Free Product (SFP) is a Shopify-only reward which allows certain products to be bought using points. It's different from a regular "Free Product" reward, which uses a 100% discount voucher. The seamless free product reward works by creating a free, single-use variant of your product when a customer claims the reward. The variant is immediately added to the customer's cart and they can quickly checkout without needing to use a voucher code. 1. Go to Manage > Create new reward> Select "Free product (seamless)"
2. 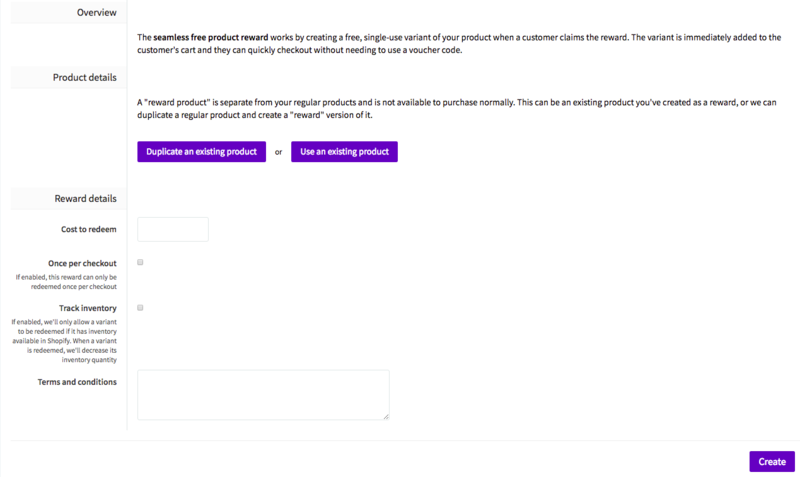 Chose "Duplicate an existing product" or "Use an existing product"
"Use existing product" - *recommended* as it's the simplest and most common as it works with the products already on your store. We check the inventory of the reference product when the customer clicks the claim button, and only allow them to claim if there is inventory available. A "reward product" is separate from your regular products and is not available to purchase normally. This can be an existing product you've created as a reward, or we can duplicate a regular product and create a "reward" version of it. 4. [optional] Tick "Once per checkout"
5. [optional] "Tick Track Inventory"
8. Free product (seamless) is all set up - well done! Note: Paid Items Required - By default, seamless free product rewards will require the shopper to have at least one paid item in their cart prior to adding the free products. This option can be disabled and customers would be able to claim free product rewards without any paid items. If you'd like to disable this option please contact support. In-cart rewards is an additional feature that can be added to SFP rewards which allows customers to see and claim seamless free product rewards through a UI widget added to the cart page. Please see if your pricing plan includes in-cart rewards. Here are the integration instructions on how to set up seamless free product with in-cart rewards. Note: this is an Advanced plan feature that requires adding code to your Shopify theme and may require a developer on your end. Can I set up a minimum spend required for seamless product reward? By default, at least one product must be in a cart for the seamless product reward to work. What happens when a customer abandons their cart, with a reward in it? After a two hour timeout, the rewards are automatically refunded and removed from the customer's cart. Can I use gift card as a seamless product reward? Unfortunately it's not possible because Shopify won't let you create a gift card with a price of 0 (which is how we handle seamless rewards).